Ukie and the 30 Years of Play campaign has revealed the best selling physical games from the past thirty years at Coutts bank in Central London. 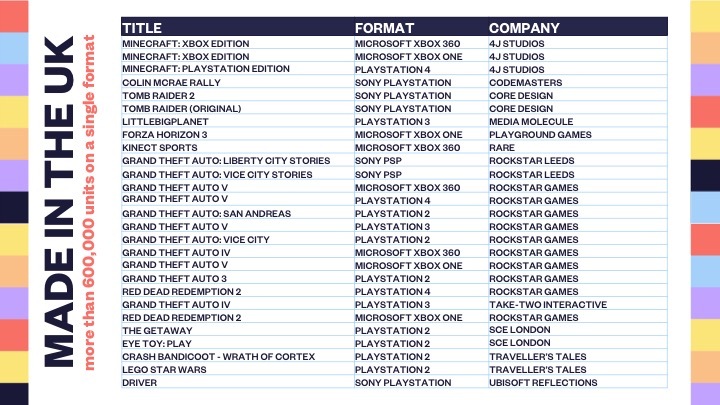 The UK Best Selling Game Awards revealed that over the past 30 years 53 titles have sold over 1m physical copies on a single SKU and that 27 UK developed games have sold over 600,000 copies according to GfK’s Chart Track data. Titles such as Red Dead Redemption 2, Mario and Sonic at the Olympic Games and Halo 3 hit the 1m figure in the UK. And great British games such as Forza Horizon 3, LittleBigPlanet and Tomb Raider each hit the 600k sales landmark, landing in the laps of consumers across the country. The awards also revealed the top 40 British game developers by units sold between 1995 and 2018. The top five companies were Rockstar, Traveller’s Tales, Codemasters, Sony and Sports Interactive, with other memorable names such as Rebellion, Rocksteady Studios, Bullfrog and Lionhead Studios making the cut. Twenty awards were handed out on the night to the companies whose games hit the key landmarks. The aim of handing out these awards was to recognise the contribution of physical games to the health of the UK market. But it also showed the wide range of games that hit the landmark, with titles like Zumba Fitness, Dr Kawashima’s Brain Training and Kinect Sports showing the extent to which the industry appeals to players across demographics. Untold Stories: Lizzie Wilding, Dovetail Games.